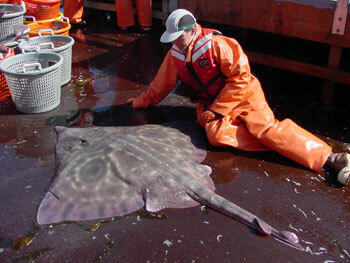 Raja binoculata (big skate). Photo by Duane Stevenson. Recent emphasis on ecosystem-level management of federally regulated marine fisheries and the recent development of a commercial fishery targeting skates in the Gulf of Alaska have underscored the need for basic biological data on these fishes. As these needs are recognized, researchers and fishery managers will require a level of detailed information on the diversity and distribution of skates in Alaskan waters that was previously not available. In response to these needs, scientists at the Alaska Fisheries Science Center have been involved in several projects that have advanced our knowledge of the skates of the North Pacific and Bering Sea. This research feature article describes several of those efforts.